This is a list of pre-release and unused content for the game Mario Party. It has been requested that this section be rewritten and expanded to include more information (tagged on TCRF has more info). The debug mode consists of minigames and a crude character select. It should be worth noting that the pages contain inaccessible entries, labeled in green . Accessible entries are in cyan . - Select a minigame, confirm a character, etc. - On game list, ask to erase game data. - Changes the game mode. - On the game list, opens the options menu to be more precise how the game handles input and such. seems to randomize elements, such as PAD0/PAD1/PAD2/PAD3 (represents P1/P2/P3/P4 controller ports respectively). PADN represents what corner is reading what controller port. GRP determines which team a player is on in certain Mini-Games. It has been requested that this section be rewritten and expanded to to have as much info as TCRF. In addition to the 50 minigames that appear in the final product, Mario Party was also planned to feature a number of other games that ended up being discarded. The character mugshots for all characters initially looked different, bearing resemblance to the style of their mugshots on the character selection screen of Mario Kart 64. Donkey Kong's initial mugshot showed just a silhouette of the character with a question mark, presumably because Nintendo had yet to finish constructing his in-game model at this point. The early character mugshots can be seen in the game's debug menu. All or Nothing (いちかばちか Ichi ka Bachi ka), a game that depended largely on luck. It was probably an early version of Chance Time, albeit with only one player and employing three ? Blocks; one block would contain a "Mario Mark" that likely had to be received in order for the player to get the full coin prize, while a "Bowser Mark" would probably cause the player to forfeit their award. Tour de Mario (ツールドマリオ), possibly planned to be a cycling game. SameGame (さめがめ), a Mario-themed take on the tile-matching puzzle game of the same name. The player must Ground Pound the tiles underneath their character to remove sections. If the character can clear all of the tiles, they can grab the treasure chest underneath; otherwise, they must go through one of the doors, which will only give them 1 coin. Yoshi's Tongue Meeting (ヨッシーのしたあわせ Yosshī no Shita Awase), in which characters sit atop a Yoshi on the left side of a river (except for Yoshi himself, who just stands in the same pose without a rider). The Yoshis have baby Wigglers on their tongues, which extend to the Wigglers' mothers, and they must reunite the children with their parents. The reunion can only happen if the A Button is pressed at the right moment; if it comes too late, the baby will kick its mother into the bush. If it comes too far, both the Wiggler and its baby will just cry. The game was once planned to feature a "Random Play Mode", in which random minigames are played one after another. There would be no board, no explanation screens, and no results screen. The positions of characters were to be determined at random, displayed on the screen using "MAIN" and "SUB". It is possible this mode was merely a debug test of the minigame randomization feature used at the end of each turn. At one point, there was planned to be another feature that is never used anywhere in the final game. 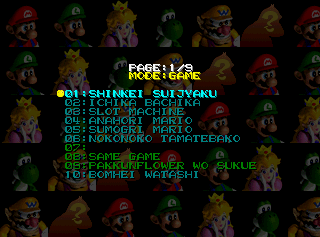 The Player Panels were once planned to turn yellow under certain circumstances after the character's turn ended, which would imply that there were once going to be yellow spaces on the boards as well as red, blue, and green. If all characters' Player Panels turned yellow, a big sign would appear reading "NO GAME", and the game would move on to the next turn without playing a mini-game. If it was the final turn, a "GAME OVER" sign would appear, and then the board's usual ending would play. Another set of early character mugshots in low quality, which are rips of official artworks that had been created for Mario Kart 64. Donkey Kong's mugshot is a covered image with a question mark. An assortment of graphics grouped together, which may have been prototype versions of the HUD graphics that appear fancier than those in the final. "Too Bad...", "Nothing...", and "Nice Going!" banners, possibly planned for minigames. An alternate texture for the Shy Guy pirate from the Shy Guy Says minigame is present. Graphics from a star appear in a similar capacity. Although stars appear in Mario Party, these graphics do not. There are three unused mushroom graphics that exist in certain Mini-Game graphic banks and general graphic directories. The green one was for Treasure Divers, the purple one was for Coin Block Bash, and the red one was for Memory Match. The font from Super Mario 64 exists. The font appears, also unused, in Mario Party 2. Models for the Bob-omb flags in Wario's Battle Canyon exist, but they are never seen in-game. In the same directory as the Mini-Game explanation graphics, there is a simple model of a Nintendo 64 controller. This page was last edited on April 2, 2019, at 18:04.